One of football's great innovators, Sid Gillman was the first coach to win Division titles in both the National (NFL) and American Football Leagues (AFL). 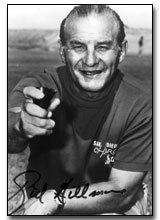 He led the Los Angeles Rams 1955-59, and the Los Angeles/San Diego Chargers 1960-71 (he was also Chargers General Manager). He won one Division title with the Rams, and five Division crowns with the Chargers. In 1963, his Chargers won the AFL Championship. The AFL Coach of the Year in 1974, Gillman is credited with the idea for the Super Bowl, the use of game films as an integral tool for coaching, and he was first to put players names on the back of their jerseys. Before he made his name in the pros, Gillman was an Ohio State All-America in 1932 and 1933. He then served as coach or head coach for 21 years at OSU, Denison University (Ohio), Miami of Ohio, West Point and Cincinnati. Among his proteges are: Al Davis, Chuck Noll, Bum Phillips, Dan Henning, Ara Parseghian and Paul Dietzel. Health played a key role during his career, but he saw coaching service with the Dallas Cowboys, Houston Oilers, Chicago Bears and Philadelphia Eagles. Sid Gillman was inducted into the NFL Hall of Fame in 1983, and the College Football Hall of Fame in 1989.